Ohio Camping At Its Best! In this article, we will talk about some awesome ways to make great-tasting chili dogs at the campsite. The first things you’re going to need are some dogs and either pre-made chili or the ingredients to make it. For this one, we’re going to assume that you’ve bought some pre-made chili and you have dogs that you’re going to cook up. For those of you who love to camp we know that food cooked over the fire tastes the best so for this article, we’re going to talk in terms of fire-cooked chili and hot dogs. What we find works the best is to cook chili over an open fire in a cast iron pot. Cast iron holds the heat very well and ensures that you get thorough heat over all the chili. The next thing is a cast iron skillet with cover. This is for the hot dogs. The cover ensures that the steam is trapped inside and so is the flavor. You want to have your chili heated and ready to go before you start the hot dogs. It’s important to keep the chili hot and have it ready to go and the hot dogs fresh off the fire. There’s another way to serve up some amazing chili dogs at the campsite as well, and this way is done by cutting up the hot dogs and cooking them inside of the chili. 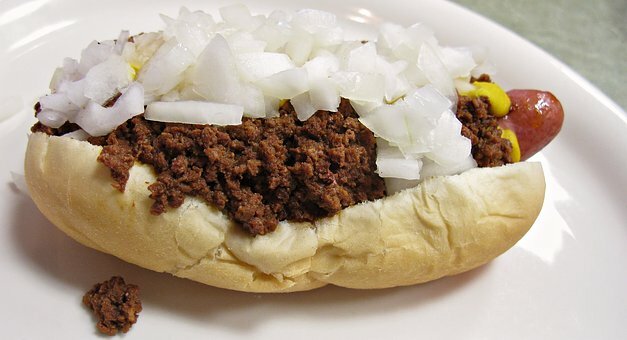 This gives your chili dog a more “sloppy joe” type feel but with the original chili dog taste. Whichever way you decide to go with chili dogs are a great addition to any camping trip. In conclusion, if you’re a chili dog lover this is a great way to make some awesome chili dogs over an open fire. You can choose to make them on a grill, gas stove, or on the electrical stove inside your RV. However you choose to do it the key to having great chili dogs is a good name brand chili and fresh hot dogs.